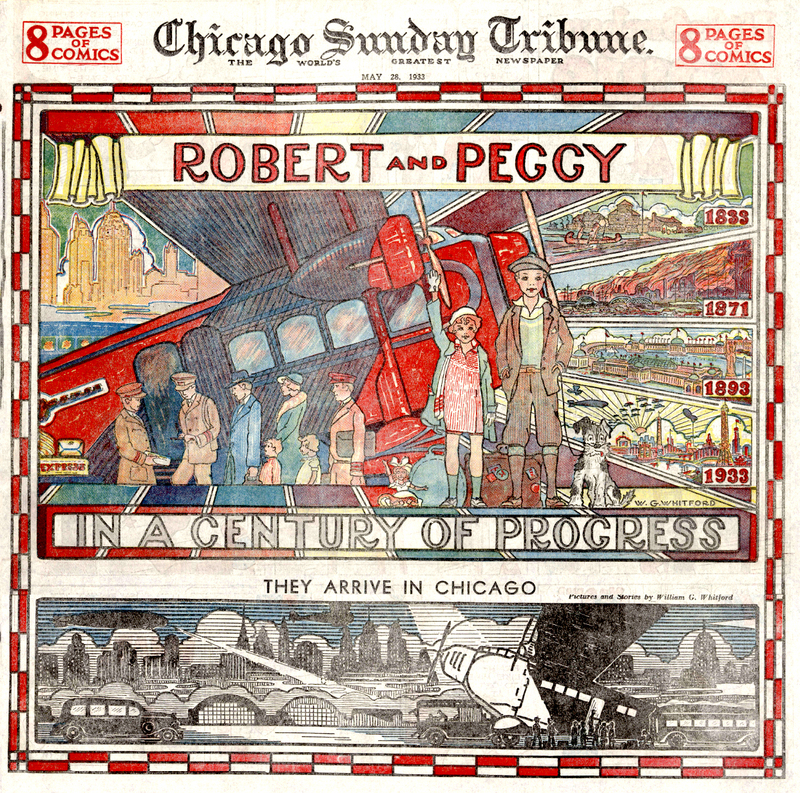 Ever since Robert and his sister Peggy were big enough to understand pictuies and to listen to stories about Chicago they have wanted to visit that city of wonders on the shores of Lake Michigan. They wished to visit Chicago this year especially, because of the World’s Fair being held there; so imagine their delight when their Uncle Jack and Aunt Emma, who live in Chicago, invited the children to pass the summer with them. Robert and Peggy are very happy, and we want you, too, to enjoy their visit. Every week a picture and story will eppear in this section telling about the many things the children saw in Chicago. Their father had told Rebert and Peggy about the interesting sights they would see on the trip. He told them how Chicago had grown from a small Indian trading post to the fourth largest city in the world, explaining how this miracle had happened in the brief period of one hundred years. The little settlement began to grow, and in 1833 it ceased being a mere village and was called a town. There were only 550 neople living in Chicago a hundred years ago, yet today it is the second largest city in the western half of the world, and nearly three and a half million people dwell within it. The great World’s Fair of 1933, called “A Century of Progress,” is being held just a hundred years after Chicago became a town. What amazing changes have taken place in Chicago and in all the world in that hundred years! Never in all time has a single century brought about so magical a transformation in the growth of a city. On almost every page of this series of stories it is stated that Chicago is the qreatest in this, or in that, in all the world. And every statement is true. Written and drawn by Professor William Garrison Whitford, Art Education, University of Chicago.